InFocus M350, the best budget 4G LTE smartphone with Dual 8-MP Camera going to launch in Indian market on Thursday, 18th June priced at Rs 7,999 Snapdeal in Black, White and Golden colour option exclusively through through Snapdeal. It will counter Lenovo A7000(Rs 8,999). The all new InFocus M350 supports Dual-SIM(Micro SIM), 4G LTE Bluetooth, Wi-Fi, GPS/ A-GPS, GPRS/ EDGE, and 3G offers you a 5-inch HD LTPS TFT LCD display with resolution (768×1280 pixels) and pixel density of 294ppi perfect for watching movies, playing games. InFocus M350 is powered by a quad-core MediaTek MT6732 processor clocked at 1.5GHz with 2GB of RAM runs on Android 4.4 kitkat OS with InLife UI on top offers blazing multitasking and creates superior gaming environment while 16GB internal Memory and up to 64GB external memory offers enough space to store your favourite songs, games and apps. 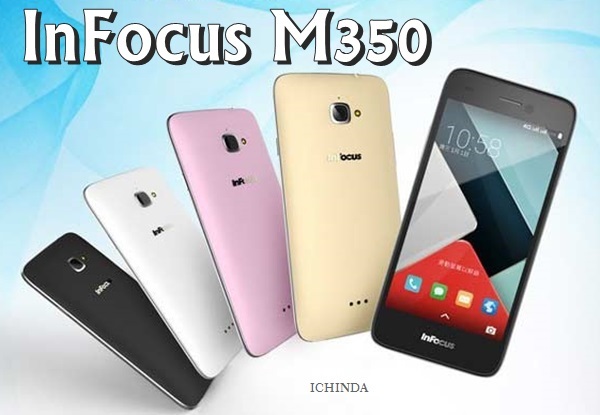 InFocus M350 combines a 8-MP Rear camera with LED Flash backside-illuminated (BSI) sensor perfect for low light photography and while 8-MP front camera with LED flash offers superior selfies and video calling experience. It’s packed with a non-removable 2010mAh battery measures 151×71.5×10.6mm and weight 146g promising Talk time up to Upto 580 mins and standby time up to Upto 380 hrs with 1 Year Brand Warranty. Infocus recently launched all new InFocus M2 in India priced at Rs 4,999 online through Snapdeal priced at Rs 4,999 in Black and White colour option. The all new InFocus M2 supports Dual-SIM(Micro SIM), Bluetooth, Wi-Fi, GPS/ A-GPS, GPRS/ EDGE, and 3G offers you a 4.2-inch WXGA LTPS TFT LCD display with resolution (768×1280 pixels) and pixel density of 355ppi powered by a quad-core MediaTek MT6582 processor clocked at 1.3GHz with 1GB of RAM runs on Android 4.4 kitkat OS with InLife UI on top offers blazing multitasking and creates superior gaming environment while 8GB internal Memory and up to 64GB external memory combines a 8-MP Rear camera with LED Flash backside-illuminated (BSI) sensor and 8-MP front camera with LED flash packed with a non-removable 2010mAh battery measures 135mm x 64.5mm x 11.1mm and weight 145g (5.1oz) promising Talk time up to Upto 480 mins and standby time up to Upto 280 hrs with 1 Year Brand Warranty. Infocus also launched all new InFocus M330 in Indian market priced at Rs 9,999 in Black and White colour option. The all new InFocus M330 supports Dual-SIM(GSM+GSM), Bluetooth, Wi-Fi, GPS/ A-GPS, GPRS/ EDGE, and 3G offers you a 55-inch HD display with resolution (768×1280 pixels) and pixel density of 267ppi perfect powered by a Octa-core MediaTek MT6592 processor clocked at 1.7GHz , Mali-450 GPU with 2GB of RAM runs on Android 4.4 kitkat OS with InLife UI on top offers blazing multitasking and creates superior gaming environment while 16GB internal Memory and up to 64GB external memory combines a 13-MP Rear camera with LED Flash, Sony Exmor R Sensor, Blue Glass Filter, f2.2 apperture speed perfect for low light photography and while 8-MP front camera with LED flash packed with a powerful non-removable 3100mAh battery measures 153.4×78.1×9.3mm and weight 167gm promising Talk time up to Upto 18 hours and standby time up to Upto 550 hrs with 1 Year Brand Warranty. At last few honest word, InFocus M350 is coming to rule the Indian smartphone market. What you think? Please be open to give your view.